The open secret at my college was that the bookstore had an unwritten policy of not pursuing shoplifters if they made it out the door. I’m not even joking; I had friends who stole every single textbook for four years. Some of them even took their thievery to the next level by selling the pilfered books back at the end of the semester. 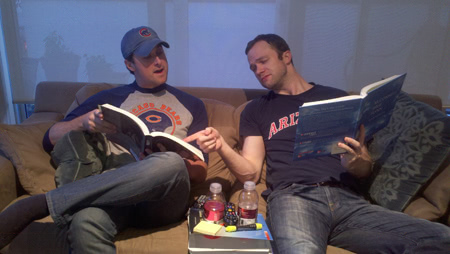 According to Aaron Priest and Adam Seithel, co-founders of Raygun, the textbook companies are the who are really doing the thieving. 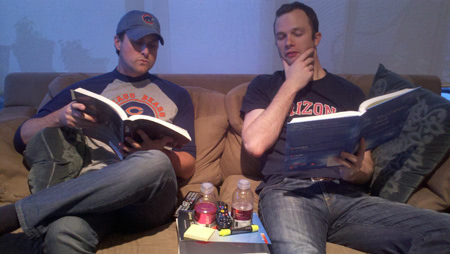 Disgusted by the rampant price-gouging in the textbook industry, Aaron and Adam teamed up to fight the forces of evil by creating guides that you can buy for 15 bucks. These “Clone Reports” outline the exact differences between the old version and the new version of your textbook, allowing you to buy the old addition for a way cheaper price. Also, if there are important differences, now you know if you need to borrow the new one from your hot lab partner. 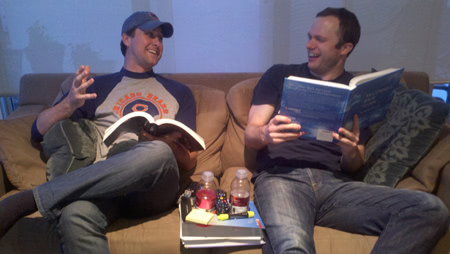 Aaron and Adam took a break from looking at cats on reddit and disrupting the textbook industry to chat with KillerStartups about what motivates them, what pisses them off, and why the textbook companies should be shaking in their pants. We wanted something that represented us. Professionally, we want to be a disruptive force in the textbook industry. Personally, we’re both huge sci-fi nerds (Spoiler Alert: Wash’s death still affects us). Get coffee. While sipping at our coffees we discuss recent stories that have posted regarding education costs, mostly focused on textbooks. We get frustrated, vent, then get to work on developing tools for students to save money on textbooks. Raygun started with the two of us over a few beers at Fado Irish pub in Chicago. We have since brought a few more people into the family who are doing work for us. It’s clear how valuable reliable people are, one huge lesson is try to find those people that believe in the vision and hold on to them. Remember the early days starting up? We’re in the early days! Maybe you can share one anecdote that describe the struggle you went through? In the beginning, less than a year ago, we were interested in partnering with a publisher or university to get this idea in the hands of students ASAP. Pitching it to universities and publishers stopped abruptly. To sum it up, we were told that our ideas weren’t welcome and that students could navigate this information deficit on their own. We were completely shut down as of about 9 months ago. We didn’t know which way to go. Instead of continuing the search for a partner, we decided to build the product ourselves. So, we drained our savings and swept away all free time we had. It’s cliché, but since then we haven’t looked back. Have you ever assassinated an Elite in Halo Reach? There is no better way to blow off steam…that, or a long, reflective walk on the beach. When/how was the last time you dealt with frustration? 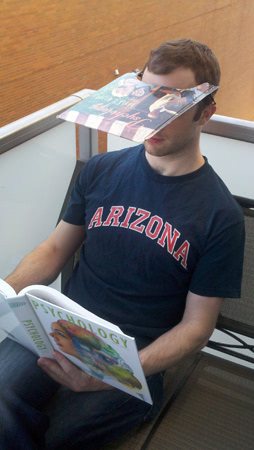 We deal with frustration every time we crack open a textbook. We get frustrated every time we see how similar a new edition is to its predecessor or when the only changes are the gender and name of a subject in the problem sets. We get frustrated every time we see the price on a new edition or when new “solutions” only further limit the flow of information to students. We get frustrated every time a bookstore or publisher claim to be saving students money. Once you get past the retinal scanners, laser-armed guard dogs, and castle moat, Raygun HQ is pretty casual. Often, it is just us and maybe one other person. We like to brainstorm together, as evidenced by the extensive whiteboards on one wall. We really have only one rule, never stifle your thought. Keep talking through it until someone else can pick up an idea and sketch it out on a whiteboard or document. Is it the kind of place where everyone is bumpin’ away to house music or is it more traditional? House music? Depends on what day of the week it is. Aaron’s tastes are a little more eclectic and he puts Spotify to work. Adam’s style is to find a new band and run them into the ground…hard. Raygun’s C.L.O.N.E. Reports are the foundation for the future. We really want to see what information students value and how they use it so that we can continue to build new solutions that work for them. Here come the Thomas Jefferson quotes. We truly believe that education should be affordable to everyone but that textbooks have unnecessarily added to the growing financial burden of education. Aaron looks to music for inspiration. Jeff Buckley, Radiohead, and whatever grunge you want. In word form, it’s gotta be Cormac McCarthy, Salman Rushdie, or Game of Thrones. Adam really likes Kurt Vonnegut, Bob Ross (because of those happy trees he’s always painting) and when he’s feeling a bit down, Edgar Allen Poe. We self-funded, but were also lucky to find a couple angel investors. Try to get a deal on everything. Except coffee. Never skimp on coffee. Also, go to your local university or college, we received great direction from DePaul University’s entrepreneurship center. Paying off student loans and then run through a field of daisies in celebration. With whatever is left over, we’d start our next idea, which just so happens to be directed at students as well. Success is an incredibly elusive thing to an entrepreneur, because it’s self-defined. As we define it? We’re not ready to say that we have reached “success.” We’ve started something. It’s something that we believe in wholeheartedly. Success will be when we’ve seen it through and when we’ve made a positive impact on how textbooks are published and perceived. If not, what’s it gonna take to make you feel successful? We got ahead of you (we’re a little bit psychic). Reddit.com. Reddit serves many purposes for us. In truth, it’s one of the first things we struck up a conversation over. Beyond that, we use it for needed distraction (a slippery slope, we know), information, inspiration, and the occasional cat photo. Dropbox, absolutely. We can’t live without it. We aren’t really thrilled with this automatic picture uploading feature, but we couldn’t work without Dropbox. Dogs all the way (Aaron is ridiculously allergic to cats). BUT, if you’re a Redditor you can’t ignore how funny cats can be. We have developed something that can be used today, without an iPad or expensive smartphone or subscription. 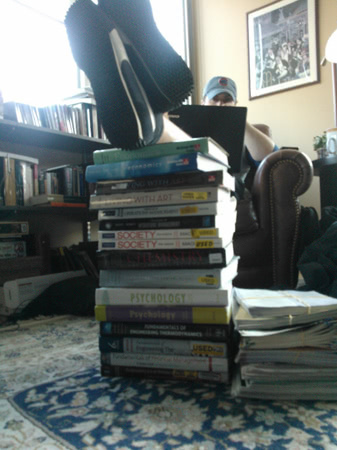 There are incredibly inexpensive textbook options for students today; all we are doing is building a bridge to them. This can seriously reduce student debt. And that’s an incredibly powerful motivator. Or they can email us directly. 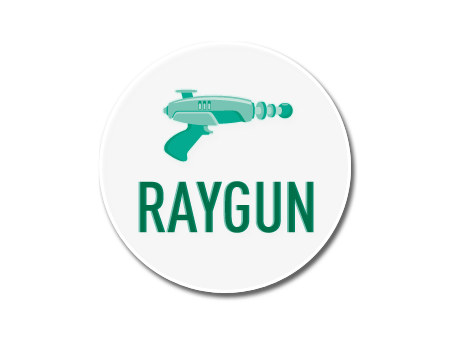 We also encourage them to check out our blog on the Raygun website. We’ll be posting all kinds of thoughts, articles, and opinions on there with regularity.